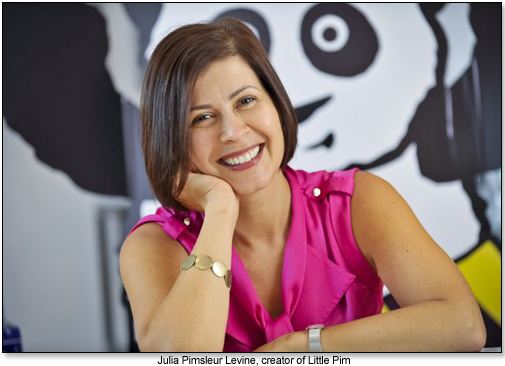 For Julia Pimsleur Levine, founder of LITTLE PIM, multilingualism has always been an important part of life. Daughter of the creator of the famous Pimsleur Method for learning foreign languages, Julia wanted to make sure her own child, and other kids, had the opportunity to learn a second language from a young age. Below, she describes how she founded her company, how Little Pim is reaching out to kids across the world, and why learning a second language is so beneficial for kids. A. Before founding Little Pim I was a documentary filmmaker and nonprofit fundraiser, and then I became a mother and decided I wanted to create something for children. I had always loved working with kids - several of the documentaries I produced were about children and education - and so when my son was born, I came up with the idea to combine my three passions of filmmaking, children and language teaching, to create the Little Pim series. I had grown up in the language teaching business so it also felt like a great way to carry on the family tradition. My father, Dr. Paul Pimsleur, created the Pimsleur Method, one of the most widely sold methods for adults to learn a language at home. A. When my child, Emmett, was about a year old, I found myself wondering how I could use the short periods I allowed him to watch television as educational time. He loved Elmo and Curious George, and I enjoyed those too, but also wanted him to start learning French. I had grown up bilingual in French and always felt that was a huge advantage in life. I wanted Emmett to experience the same benefits as I did of being bilingual. I was already singing and speaking to him in French, but I wanted him to have something that he could watch while I was at work, and use with his father and caretaker too, who don't speak French. That's when I came up with the idea of a language teaching series using video for kids, and Little Pim was born. I always imagined it as a kind of "Rosetta Stone meets Baby Einstein" and wanted it to be as fun as it was effective and educational. The core method at the heart of Little Pim is the Entertainment Immersion Method, which leads with the entertainment to keep kids engaged, but has an effective language teaching method embedded within it. A. I spent two years creating the Little Pim series. I took my time, in part because I had seen my parents create the popular Pimsleur Method of language learning, and knew I wanted this product to be as high quality as the Pimsleur Method was, and as long lasting. Over the two-year period I worked with a leading neuroscientist from the Rutgers Infancy Studies Lab, Dr. April Benasich, and recruited award-winning filmmakers and animators, as well as a team of educators and two fluent experts for each language. We filmed over 200 kids for the Little Pim series and spent 6 months editing the series to come up with our 6-DVD series. We also filmed in High Def so everything looks crisp and great on the big or small screen. One of the first things we often hear from parents who buy Little Pim videos is that they are very pleased with the high quality. That makes me very happy, as we spent a lot of time, money and effort to ensure parents would have an outstanding product for their kids. A. Little Pim has worked with Head Start, a program of the United States Department of Health and Human Services that provides comprehensive education, health, nutrition, and parent involvement services to low-income children and their families. We donated our English as a Second Language (ESL) videos to Head Start families in New York, to help kids from disadvantaged primarily Spanish- speaking homes learn the 500 words children should know entering Kindergarten. We also work with One Laptop per Child, set up to oversee the creation of affordable educational devices for use in the developing world. We are proud that over three million children in Africa and Latin America are currently learning English as a Second Language with Little Pim on One Laptop per Child free computers, creating educational and professional opportunities for them that would be impossible without speaking English. A. Kids learning a second language in the U.S. are gaining a valuable skill and a window onto exciting opportunities to travel, work abroad and get higher paying jobs at home. For kids in developing nations, or kids in the U.S. who don't speak English, learning English is often the difference between access to work or not, a life of poverty or opportunity. We want to help these children take advantage of their best language learning window, up to age six, when their brains are hard-wired to learn language with ease. 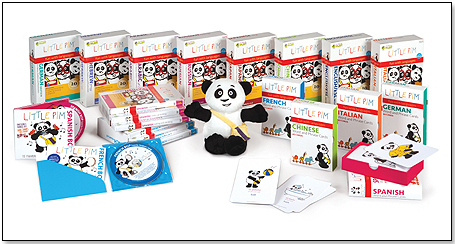 With Little Pim the parents and teachers don't need to speak English, they can learn from Little Pim the panda and get started on a lifetime journey of language riches. We are proud to be one of the first foundational bricks in that journey, through One Laptop per Child and Head Start. A. I have been involved in working with nonprofits since high school, where I volunteered for three years working with the blind, and then in college worked with educational programs that benefited low income kids in New Haven, CT. I later produced documentaries that shed light on pressing social issues such as race discrimination and low income families without proper access to education. This led to my second career as a nonprofit fundraiser, where I helped drive over $20M in donations to human rights nonprofits such as Witness, Echoing Green and Jewish Funds for Justice. I remain actively involved in several nonprofits, including serving on the Advisory Board of Global Language Project, a NY-based nonprofit that brings free foreign language teaching to kids in disadvantaged public schools. Q. What do you consider to be your greatest accomplishment in the children's products industry? Why? A. At Little Pim we have a very big mission – we want to transform how children learn a second language around the world. Before Little Pim, there was no affordable easy way for parents to be their child's first language teacher and to help them start learning at the age they learn best. We are so proud of the millions of kids who have gotten started learning a language with Little Pim and are excited to see where their languages will take them, on the world stage and in our global economy. Q. How do you hope your products affect children's lives? A. We want kids to love foreign language learning and Little Pim is making that come true. We know that no three year old is going to tug on her mom's pant leg and say "I want to learn Mandarin!" But she will tug on that pant leg and say "I want to watch the Panda!" When this happens, as it does every day, kids are learning, and parents are able to give their child an amazing gift that previously might only have been available to parents with significant disposable income. When this happens, we at Little Pim are fulfilling our mission of helping to transform language teaching for kids world-wide and bringing joy to millions of kids while we do it. It is a privilege to be a trusted source of education and edutainment for the parents who buy our products. We take that responsibility to heart, and are actively involved with our community of parents and caregivers, providing new learning resources, asking for input on new products and helping them to be their child's first language tutor, even if they don't speak the language themselves. Little Pim French Intro Gift Set by LITTLE PIM CO.
Other products from LITTLE PIM CO.
Includes Little Pim French: eating and drinking (Disc 1), French Bop music CD, and an 8” Little Pim plush panda, all packaged in reusable see-through tote. Little Pim French: eating and drinking introduces over 60 words and phrases used at mealtime. French Bop features 15 songs, three by kid’s music star Milkshake. Chinese Gift Set (Vol. 1) by LITTLE PIM CO. Together, these three DVDs will introduce kids to 180 Chinese (Mandarin) words and phrases. Using Little Pim’s unique Entertainment Immersion Method, Little Pim will captivate children by turning everyday activities into fun adventures. The DVDs combine animation and real kids, teaching simple words and phrases for everyday activities. Includes 3 Chinese DVDs (eating and drinking, wake up smiling, playtime); 8" velvety soft plush Little Pim panda, and a fun, see-through Little Pim tote bag. Little Pim Chinese Word and Phrase Cards by LITTLE PIM CO.
Little Pim Chinese Word and Phrase Cards are beautifully drawn and introduce 60 words and phrases. They feature lovable Little Pim, the panda, and include phonetic translation for adults. The cards can be used on their own or as part of the Little Pim DVD series. Little Pim Spanish Intro Gift Set with Book by LITTLE PIM CO. The Little Pim Spanish Intro Gift Set includes Spanish DVD eating and drinking (Disc 1), Spanish Bop music CD, Little Pim trilingual board book- Colors or Feelings, and an adorable 9” plush panda, packaged in a handy, reusable Little Pim tote. The DVD introduces 60 Spanish words and phrases for mealtime, and the music CD features songs by Milkshake and Dan Zanes & Friends, stars of the children's music circuit. "Little Pim is the first language immersion product that specializes in introducing foreign languages to babies, toddlers and preschoolers," Ashely Hernandez, Little Pim sales associate, told TDmonthly. Launch date: March 2012. Awards: 2012 National Parenting Center Seal of Approval; Dr. Toy 100 Best Toys for 2012; Dr. Toy 10 Best Audio-Visual Toys for 2012; 2012 Tillywig Brain Child Award; 2010 National Parenting Center Seal of Approval; 2008 iParenting Media Award; 2010 Dr. Toy Best Audio Visual Award; 2007 Parent-to-Parent Adding Wisdom Award; 2010 Creative Child Media of the Year Award; 2009 AEP Award. 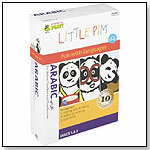 Little Pim: Foreign Language and Fun DVD 3-pak by LITTLE PIM CO.